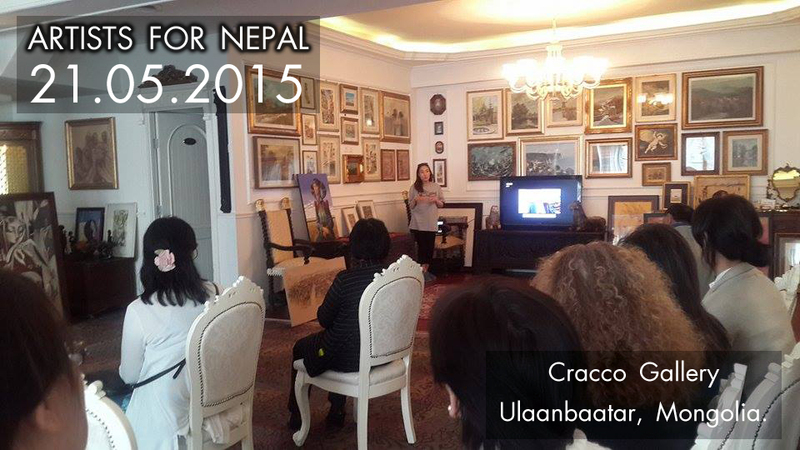 In response to the recent disaster in Nepal, Mongolian Art and Culture in London decided to join Artists For Nepal appeal. Artists For Nepal is uniting artists, curators & art lovers across disciplines & boundaries, with exhibitions, performances, talks, installations, screenings & readings already confirmed in locations including Ulaanbaatar, London, New York, Adelaide, Brisbane, Delhi, Mumbai & Mexico City. Any funds raised go to a NGO of each individual 's choice, sending a message to the media & the world of the power of the arts for social change & our support for Nepal. Our event in London was a great success raising £854 after the expenses, all collected from raffle ticket and auction sales, commissions from artwork sales donated by Mongolian and British artists, items donated by our guests and friends as well as cash donations. We had a fantastic turnout despite the short marketing period and had a very enjoyable evening raising funds for a good cause. Our team keep receiving warm and kind thank you messages from those who attended our fundraising event and see lovely photos posted on social media already. We would like to thank everyone who came to support our event for a good cause in support of Nepal, including our guest speaker Mrs Denis Prior of Community Action Nepal, a charity we are fundraising for, Gaynor O’Flynn, a British artist and Founder of Artists For Nepal, Mr. Jargalsaikhan Dambadarjaa, DeFacto presenter from Mongolia, John Man, author, Ts. Ariunsanaa, Counsellor (Finance and Economic Affairs) at the Mongolian Embassy in London, the representatives of the Mongolian Association in the UK and our Mongolian artists and creatives including Kh. Elbegzaya, S. Altantsooj, Ariungerel Richards, D. Semjidmaa and M. Munkhzorigt, who attended the event, friends and families who so generously supported us, including Brandon and Otgoo, who donated and those who were thinking of us on the evening. Huge thanks go to those who bought raffle tickets and auction items helping us raise funds. Our big thanks to CEB Douglas James Scott for taking time from his busy schedule during this difficult time to send his personal recorded message and donating a signed photograph of him and his colleague CEB Chris Bonnington, a British climber. It certainly attracted huge attraction for our auction and raised £170! Our special thanks go to the British artists Michael Ormiston and Candida Valentino, who provided entertainment for our guests on the evening. They were amazing and their music certainly touched DeFacto Jargalsaikhan that he invited them to appear on his show whenever they are next in Mongolia. Thanks to Michael and Candida especially, who kindly and generously donated a substantial amount of £230 in cash from her previous fundraising events selling CDs and mandals on top of several items donated for our event donating 100% of the proceeds. Mongolian artists Otgonbayar Tod and Ariungerel Richards have also donated and are kindly sending 10-30 per cent of the sales for our fundraising. Thanks to Mongolian artists who sent us their artworks in for auctioning, including Ch. Sendem and T. Nurmaajav. 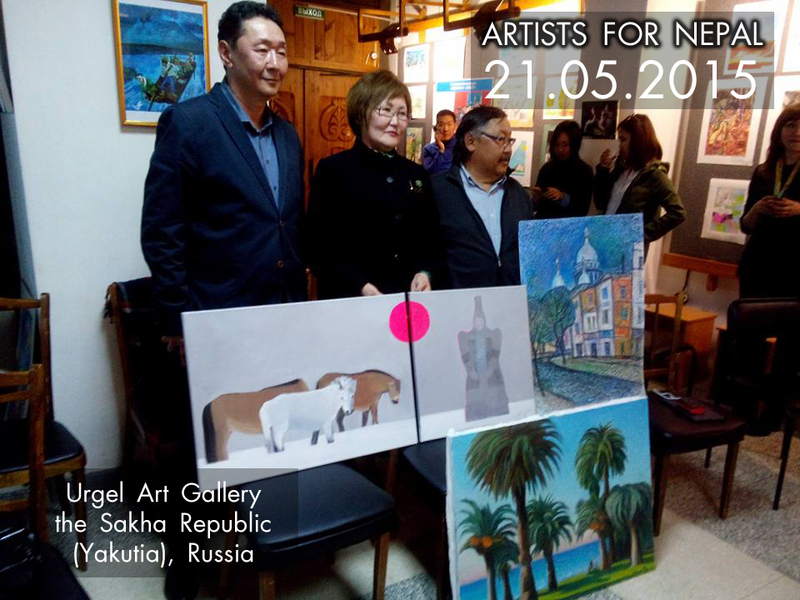 Most importantly, we would like to thank the team in Ulaanbaatar at Ceylonta Restaurant and Cracco Gallery and the team in the Sakha Republic (Yakutia), who brought the artists and art lovers together to raise funds for the cause. We, at Mongolian Art and Culture in London would like to thank our dear friend B. Amarjargal, who supported us from the start and organized all three events in collaboration with us and all her team members and artists at each organisation individually. It will mean a lot for Community Action Nepal, who will directly send the funds in implementing their work for the Nepalese in time of great need. Lastly, I would like personally to thank our team whose immense input helped me to organise this event successfully: British artists Michael Ormiston, Candida Valentino, Azkhuu Tsamba of Azaa Studio, who designed and produced all our marketing and presentation of materials and Anushka of Creative Curating. We will keep sending the funds to Community Action Nepal without delay and will keep directing any further funds to them if and when come through via us. Keep praying for Nepal and continue doing good deeds.